At almost any given time, a writer can find submission windows for “character driven” works of fiction. And even stories that are plot-driven are almost infinitely better with a good dose of personal development. For some writers, character development is very instinctive. Those folks may get some ideas from this post. However, this advice maybe invaluable to the other variety, who concoct great plots but have trouble creating characters who “stick” with their readers and fail to deliver the emotional power of personal growth and maturity. Before I begin the blog post, I would preface that this is simply an approach to development. There is no “one size fits all” methodology for design and authors should always be encouraged to try new techniques to prevent stagnation. Think of the advice in this post as a tool, to be used when and where your instincts say it is appropriate. Pragmatism isn’t without virtue. Use what’s useful, ignore what isn’t, and always strive to do more. Is a Character’s Personal History Necessary? One of the most important questions an author should ask themselves when creating a tale is whether or not a character necessarily needs a background, at least at first. From a franchise focus, character biographies are incredibly valuable. They offer depth and intrigue and can be a source of great stories in and of themselves thanks to something called the Zeigarnik Effect. They also help keep your characters more consistent, which is a must for longer, on-going arcs. Some story-featured video games even go so far as to have backstories constitute large portions (sometimes half) their material, such as Mass Effect 2 and Shadowrun Hong Kong. Backstories can intrigue readers but they often need to feel compelled to curiosity. Why does Professor Snape have it in for Harry Potter? What happened between Cobb and Mal in Inception that kept him from being able to go home to America? And the recent Jessica Jones on Netflix is an excellent example of why it can pay to hide a superhero’s background for a while, as opposed to revealing the origin story immediately. But if the goal is to write a short story around a totally fresh character, it may actually pay not to flesh out the personal history yet, or at least avoid exploring it in the current yarn. If a stranger tries to give us his/her life’s story at a bar, we’re usually not interested. But if we get to know them for a while, we might be inclined to ask how they became so funny or morose. Where they got that scar or what made them arrive in this town or city. Likewise, it’s incredibly easy for a character’s history to devour more than its fair share from the precious word count. Tack on a greater plot arc and/or world building elements and it could easily become impossible to tell the story in fewer than 8,000 words. A character’s past is, more often than not, worth developing and discussing. But if you’re struggling to fit a 12,000 word tale into two-thirds that size, consider if the person’s history can be saved for exploration later. Or is needed at all– sometimes the mystery is better than the truth! Homework Assignment: Think back on all the books, movies, games and television you’ve enjoyed. Pick out three to five characters you liked whose backgrounds are never explored. Try to discern why you were so impressed with them. the rational investigation of the truths and principles of being, knowledge, or conduct. any of the three branches, namely natural philosophy, moral philosophy, and metaphysical philosophy, that are accepted as composing this study. Developing a philosophy for a character is nothing less than 50% of that person. By creating guiding principles for characters, authors may find that their casts’ actions and reactions are a foregone conclusion. For example, Alan Moore realized the fate of Rorschach many, many issues before the conclusion of Watchmen, but not when first beginning to write the series. That is not to say that philosophy is the beginning and end of character design however. Much like the debate as to the origin of fear, philosophy can be constructed from experience, but may also overcome and learn from the past as well. History is very often the other half of a character. Nor is a person’s philosophy necessarily defined from the beginning, rather they may discover things about themselves when confronted with unforeseen situations. Marvel’s Daredevil addressed this very well. Try developing a character both ways; writing the philosophy first and then the history, and then vice versa. Then try it piece by piece. Studying philosophy is best performed by forcing one to try and discover the rational arguments that maybe counter to one’s personal beliefs. If one is conservative, read more liberal news sources. If one is progressive, seek out counter viewpoints from the opposition’s own outlets. No matter how annoying or disgusting they may initially be, try not to block or mute friends and family whose political views mortify you. Try to learn the basis of their thinking and if nothing else, take a sharp look at history (personal or political) for the answer. An estimate is better than a complete guess, and both are better than flat, uninspired stereotypes. Homework Assignment: For fellow writers, take your character(s) and have them undergo a few basic ethics litmus tests, such as whether or not a person deserves less (or any) jail time for stealing a loaf of bread to feed their family. Try to find points of difference between your own views, to gauge whether or not you potentially have a Mary Sue. If there was one consistent, perfect philosophy, would it wipe all others out like the correct answer to a math problem? Something proven true beyond the shadow of doubt, an approach to law and morality that everyone instinctively deems fair and reasonable? An approach to thinking that is always unlocking new knowledge and wisdom? A manner of reasoning that is so often “correct” that the philosophy itself is all but factually true? Obviously, that has never happened. Well, maybe in the fairly utopian Federation of Star Trek, and that worked because the show’s conflict usually revolved around cultural friction between alien relations and galactic emergencies. For the rest of us though, conflicts and hypocrisy abound in both real life and fiction. Hypocrisy, as a thematic element in storytelling, is an awesome source of intrigue. Many readers are strangely sympathetic to characters who do rotten, even heinous acts, provided either they know it’s wrong or figure some justification that leads to understanding of their decision. But it’s also something they cannot stand if improperly executed. Dexter is a possible example of this very thing, while more critically acclaimed works include The Scarlet Letter, Andrew Ryan from Bioshock and the self-delusions of the lead characters of AMC’s Breaking Bad. Strangely enough, even children shows can have surprisingly well performed moral-turns. In the episode “The Ultimate Doom” from the first television series of Transformers, paragon of justice Optimus Prime is convinced by the villainous Megatron to effectively betray the Earth. With their home planet suffering from an energy-famine, Prime feels forced to activate a device that summons Cybertron into our planet’s orbit. The gravity shift causes myriad environmental disasters. (If this plot sounds familiar, it’s because it was reused in the movie Transformers: Dark of the Moon.) For the previous episodes, it was easy to put a fellow like Optimus Prime on a pedestal for his benevolent behavior. But this particular episode was a shocking twist that made complete sense. If poorly written however, it can be seen as a kind of violation of the writer’s contract with the reader at best, and a plot hole at worst. No one enjoys betrayal without explanation or at least some justification. Likewise, because hypocrisy can easily be intertwined with a person’s history, dealing with a moral twist effectively can greatly ramp up the needed word count to finish a story, so authors should be advised to factor the added pages when devising a manuscript. Homework Assignment: What’s the fine line between hypocrisy and a change of opinion or growth? Do your characters answer that question the same way? For Villains, Are They Unapologetic or Justified? Villains. Gods, we love our villains. There’s a psychological trick at play when it comes to understanding why audiences love a strong villain, possibly because the role itself makes almost anything permissible. We can admire and respect them with sympathy, or we can despise and hate them with the most intense loathing and rancor… and neither is wrong. Villains can be anything except boring. Roy Batty, from Blade Runner, who attempted to extend the lifespan for both he and his colleagues, who were effectively genetically engineered slaves who live a mere four years. The Operative, played by Chiwetel Ejiofor, in Serenity. Admittedly, the incident that the Operative was trying to cover up was terrible. However, it’s worth pointing out that keeping a lid on it also prevents others from using the same technology for horrific ends. Doctor Octopus of Spider-Man 2. The accident that pushed him over the edge was really just that, an accident. Meanwhile, the work he was doing could have greatly revolutionized energy production. Julie Marsden of Jezebel, whose vanity costs her engagement to Preston Dillard. Her antics were a threat to her former fiance’s marriage and later his life. She does however, somewhat prove her genuine love for him by offering to treat his yellow fever in place of his wife. A few of the major characters of Watchmen, who will not be mentioned as to protect the reader from spoilers. But there are also the unapologetic types. True forces of nature, these types are motivated either by forces we may not (and perhaps never will) comprehend, or by understandable but primal forces or desires. The Joker, both in The Dark Knight and Alan Moore’s The Killing Joke, who was effectively raw chaos and randomness. Anton Chigurh from No Country For Old Men, both the book and movie. It can be said that Chigurh is little more than an avatar of death itself. The shark from Jaws, as it was an animal acting entirely on instincts. Likewise, the xenomorphs from the Aliens franchise, as their predatory instincts were a key factor to their reproduction. Cthulu from the mythos of H.P. Lovecraft. George RR Martin uses both varieties in A Song of Ice and Fire. For the justified, he divides his readers, causing them to cheer for various contenders for the throne, yet making the choices gray and not without cost, such as Stannis Baratheon or Daenerys Targaryen. Likewise, he uses a slew of entirely despicable types who provide no excuse for their antics, such as Joffrey Baratheon and Ramsay Snow. Homework Assignment: Here’s a real tough one. Was John Doe, the villain of Se7en, a justified villain or an unapologetic one? Or was he both? I got home from a wedding in time to see the season premiere of The Walking Dead on AMC. I was actually something of an interested fan before the show, having read some of the great graphic novels that were available. And when I heard about the show coming out, I had nothing but phrase for AMC for trying something as wild as a zombie survival drama. One of the things that is driving me crazy is how close the story was to the comic at first before the show’s creators decided to do their own thing. You see in the comic, Shane Walsh is killed in the first novel. So far, it hasn’t happened. Yet. In both the comic and the show, Shane engaged in an affair with the wife of his friend and partner, Rick Grimes. That came to an end when Rick reappears, alive and well. In the comic, a jealous Shane tries to kill Rick, only to be killed by Rick’s son. Well, the sadistic creators of the show decided to once again suggest that it was about to happen, only for something more unexpected and actually worse to occur in the season premiere. I won’t say what, but let’s just say I’m used to shocking plot hooks like that happening in season finales, not premieres. It wasn’t bad by any means. It just didn’t add much to the experience. There were a few good, new ideas in it. But that was all. Anyway, back to The Walking Dead. One of the things that got me about this premiere was that they actually touched upon the weakest scene in the season finale. You season, season 1 ended with the group finding the CDC, Center for Disease Control, (it’s an actual U.S. agency for those of you not from these parts). There, a scientist explained all this sad stuff about how the world was failing and even gave a little insight into the nature of the walkers. Then he explained that the CDC center was going to explode. That’s right. In case of emergency, the CDC will explode. * Important safety tip for anyone reading. Now in this scene, Andrea decides she wants to stay and wait for the explosion to claim her life. She wants to die? Fine. She’s not alone. The scientist and the woman who formerly worked for the city’s building permits office wanted to as well. But Dale, the elderly chap whose wisdom, personality and light sense of humor I’ve come to admire, refused to see Andrea give up like this. 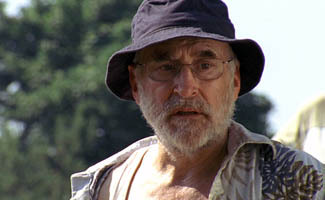 Of course, Dale reserved his compassion for living only for Andrea. Never mind the scientist or the other woman. Andrea sort of called him on this in the season premiere. Besides The Walking Dead, I finished the fifth disc of season 2 of Lost. Apparently, this is a massive undertaking given the length of Lost: six seasons, roughly 8 discs a season and around 4 episodes a disc. Let’s say that’s actually 30 episodes a season (last disc usually only has one or two episodes). That’s 180 episodes of an average length of around 45 minutes a pop. But I’m determined to finish it. *-I’m kidding. Do not take my statement seriously.